I have been quite active extending my business network since my last article a couple months ago. Within a few months I expect to sustain my family with mostly Myanmar income. One of the people I recently met was Jouni, who came from London to create the most innovative web agency in Myanmar. We plan to work together in the future, as we share the same technology background and have the same vision of excellence in IT. As we were stuck in traffic jams, Jouni made the remark that Myanmar people will only try collective solutions after the individualistic ones have failed. As a consequence, we should wish for the city to be so clogged by car traffic (air pollution that not matter) that the leaders have no choice but to investigate those collective solutions. Traffic jams are very egalitarian, they afflict rich and poor the same. Yangon is suffering from anarchic construction. Everywhere, old trees, gardens and heritage buildings are being wiped to make room for ridiculously expensive condominiums that will remain empty since nobody can afford the prices asked. There seems to be no will from public authorities to anticipate and improve the public infrastructure (roads, electricity, sewage system) before it is too late. With 30% more cars in the street every year, this is critical. Nouveau riche are showing off everywhere in Yangon, by building the biggest houses (complete with neoclassical columns), by purchasing the biggest and most wasteful cars (hummer for example), by gold-plating even walls. I know few wealthy people who behave low-profile and it is because they are hated enough that they do not want to be recognized in public. The use of private security people is widespread, every door or window is protected by a steel grid, barbed wire lives at the top of every wall to protect from undesired exposure. How about trespassers, will they be shot on sight? When purchasing the biggest cars some may be thinking that “in case of accident the other will die and not me”. The driving problems are made worse by the total disrespect for the driving rules, where everything is allowed to pass before the neighbor, at the cost of making the problem worse collectively (driving in one-way lane, doubling on right, use the turn-right-only lane to actually go straight). I find very funny that many cars proudly display a “drive safely” sticker. Civil servants and private sector employees are underpaid, they do not get their share of growing economy. After all, only the “investor” is taking risk so they should reap all the reward. As consequence, corruption of policemen is widespread, public sector bleeds (especially in the medical staff) and private sector employees jump ship at first opportunity, as their employer show no consideration to them. The same short-sighted mentality is also found in business relationships, where no investment is done by Myanmar party unless the foreign party pays for the feasibility study and pilot projects. “If they don’t pay all, we don’t go”. In western businesses it is expected that when researching new ventures everyone takes their share of investment if they want a share of future profits. By not sharing control nor doing any investment, by trying to corner the markets as if they were still closed, Myanmar businesses are headed to painful times, as they won’t have fixed their competitiveness and productivity issues when efficient foreign competitors enter the market. As we were returning from dinner with our good friends in Shwe Sa Bwe restaurant, we suspected that our driver is drunk, as he barely managed to extract our car from the parking lot, missed the crossing of Parami and Kaba Aye Pagoda roads, would not stay on the lane and in general took very dangerous moves. We had to tell the driver to slow down and return home at senator’s pace. During the 2 years I have been living in this country, I have seen a number of drivers. My little family share two cars and drivers with my wife’s parents and sister. If one of the drivers has been with us all these years, we were not so lucky with the second driver. In Myanmar, it can be quite difficult to find good drivers and then keep them, because the turnover in a full-employment country is be very high, resulting in either low-quality and/or more demanding applicants (we are quite open). the trusty and reliable driver, who drives safely and can anticipate our every move to save your time. He stayed with us for more than 2 years, even if he once considered becoming a taxi driver, we treat him as if he is family. the young and impertinent driver, who abandons the car and visits my friend’s house without asking for permission. After he was resigned we found out that he had show us a fake driving license. the 65 year old, quite friendly driver, with his tattoos and large smile, who (at our surprise) left after 3 months because he wanted to earn more to sustain his two permanent mistresses. the youngest of all, our interim driver, who is paid by father-in-law’s company and that we borrow every time we need an extra driver. I like him quite a lot even if his English is limited. the last driver, with his teeth stained by betel, who drove us while drunk the other night. We decided to let that last driver go on 31st December because of his unacceptable behavior. However, he surprised us by resigning on his own to “become a taxi driver”. My mother-in-law was so pleased that she let him go early with his full month paid. My father-in-law doubts that he will be successful as taxi driver, as he has to learn to not scare away the clients. We will know soon what happens to him, because taxi drivers have to pay 10.000 kyats (around $12) per day to the taxi owner, which is quite a lot for local people. So, if you are a skilled driver looking for a new home in 2013, who behaves well, please contact us. You will be paid well and have bonuses every time you have to stay after 19h00. Dear reader, I wish you a mingalar 2013, that is a year of joy and prosperity. The Diva and her mother spent Christmas Eve in Mandalay, paid handsomely to entertain the guests of the Christmas party at the local Grand Hotel. They were to return to Yangon on the next day. 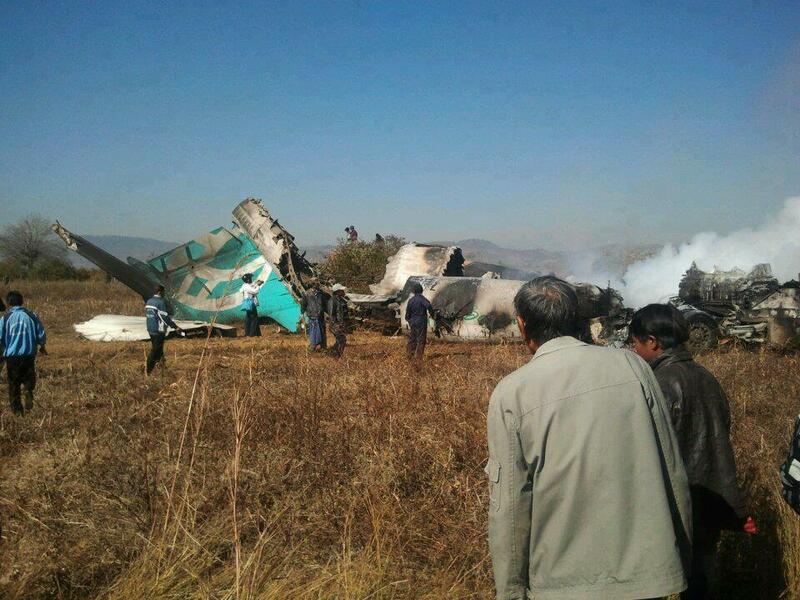 On the morning of 25th December 2012, as the Diva was in the air, rumor spread that a plane headed to Yangon had emergency landing near Heho airport then took fire. The rumor came from a friend who is working in the travel industry and whose client is waiting in Heho. At the moment, it was impossible to get news about the accident, impossible to contact the Diva on the phone. Text messages are sent. Google is queried. Facebook pages are reloaded. Anxiety grows. The wildest speculation take place. What if the Diva was on that plane? After all, doesn’t she use to fly all the time with that airline? Can it be her plane that just crashed? Finally, the Diva called, she just arrived at the airport, and did not know about the drama going on. Everyone is relieved. By sheer luck, she took another plane, as the Grand Hotel booked her tickets on another airline. May the disaster of the W9-011 flight and the death of two people have the effect to force Myanmar government and airlines to work together to improve the lacking security. This short article tells the tale of housing bubbles that I feel are growing to unsupportable levels here in Myanmar. Since I am writing this in November 2012, it can be interesting to compare with this article from January 2012 where office space in Sakura Tower rented for 50 USD per square meter per month, double from the previous year. This morning, I had breakfast at Trader’s Hotel with Mr Lauwence, an investor in the hotel business who just arrived from California to visit Myanmar and see if the country is worth investing or not. 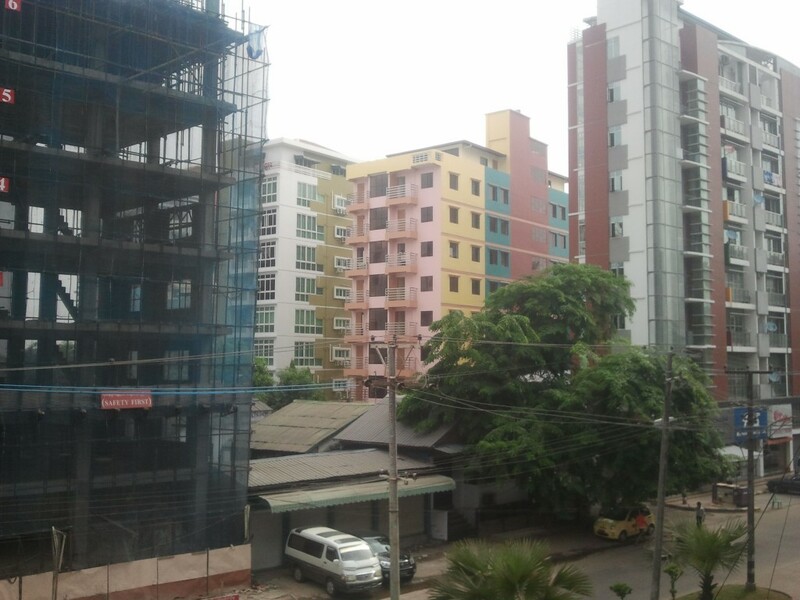 As I explained my guest that office space rental in Sakura Tower, just other side of Trader’s Hotel, already hit 80 USD per square meter per month in Yangon, his wife was shocked and said “it is more expensive than in New York”. Mr Dominique, a long-time French expatriate who is giving advice to companies wanting to establish a presence in Myanmar, has his office at 8th floor of the almost empty CentrePoint Tower, where the monthly rental is 50 USD per square meter. The whole tower is empty except for a few floors, but everything is being renovated waiting for new companies to rent the office at the “cheaper” (compared to Sakura) rate. The new neighbor of Mr Dominique is an investment fund who just signed a 3 year lease for 200 square meters (that means they agree to pay the hefty sum of 360,000 USD over 3 years in a country where 100 USD buys a month of a housemaid’s time). Kyi Kyi Mya, friend and spiritual grandmother of our family, was contacted by French guy who wants to rent her family house in Tamwe Township for 48 Lakhs per month (4,000 USD per month at current rate). The new occupant will renovate the old building in exchange for reduced rate the first year. Zu, lady doctor and friend of my wife, lives in the family house on Pyay Road. The house is made of wood and bricks and has seen little renovation since a British architect designed it 70 years ago. The land is worth 1,000,000 USD at “market price” and won’t be sold as long as the grandmother lives. When it is sold (the temptation is big), the future owner is likely to destroy the old house and build another of these McMansions that you see all over Yangon, complete with fake neoclassical columns, garage for 2 SUV, lots of windows but no garden or any space to breathe. Mr Rajiv came from India two years ago to work for a local business man as Managing Director. He has been living in a standard 4 room condominium in the aging Excel Tower near the crossing of Shwegonedaing and Kaba Aye Pagoda roads. He told my father-in-law that his proprietor wants to hike his rental rate from 8 (1,000 USD) to more than 13 Lakhs (1,600 USD). If his salary does not increase to match the rent increase, what is the point of working hard if everything is pocketed by renters (who don’t even pay tax)? At least with State taxation a part of the money will be used to pay teachers, improve roads and build hospitals and not to speculate on real estate. I didn’t explain it yet but in Myanmar condominium rentals are paid 1 year in advance, in cash of course. When I arrived in February 2011 we paid 42 Lakhs (4,200 USD with exchange rate of 1,000 USD per MMK) for the year. When we renewed in February 2012 we paid 48 Lakhs (6,400 USD with exchange rate of 750 USD per MMK). We got a chance to lock the rate by renewing early in August 2012 for 48 Lakhs (5,400 USD at 880 USD per MMK). My wife tell me that the current “market value” of our apartment is now 6 Lakhs per month (72 per year). Unless the local currency evaluates to match the inflation we are not going to be able to follow at the next renewal. My wife explained me that proprietors of serviced apartments prefer to rent to long-term tourist or businessmen who find hotel accommodation to be too expensive now (3 digit prices), and that increases the pressure on existing rents. Our choices will either to pay the increased rent, to downgrade to an apartment (smaller and without electrical lift), or to think about relocating to another country where highly qualified professionals are actually paid for their work. With the normal people salaries stagnating and all this foreign money entering the country, I don’t know what will happen next. Will there be inflation of local prices (as the production of goods does not match the increase of money supply) or will there be devaluation versus other currencies (I yet have to find industrial products sold here that are “Made in Myanmar”)? Myanmar is a mystery to me, why so much money in so few hands when the country produces nothing but natural gas, raw timber and unrefined agricultural products? Myanmar Government should be careful on these issues and stop the bubbles by taxing all these unproductive uses of money. Not only the burden of rent is starting to make impossible to earn a living in this country, but it also encourages us qualified workers (Myanmar nationals who are still there, just returned from abroad or were adopted like your bamar-yu) to consider leaving for more reasonable countries in ASEAN such as Malaysia or Thailand. Will the unregulated greed of renters kill the Myanmar economic Miracle just after take off? 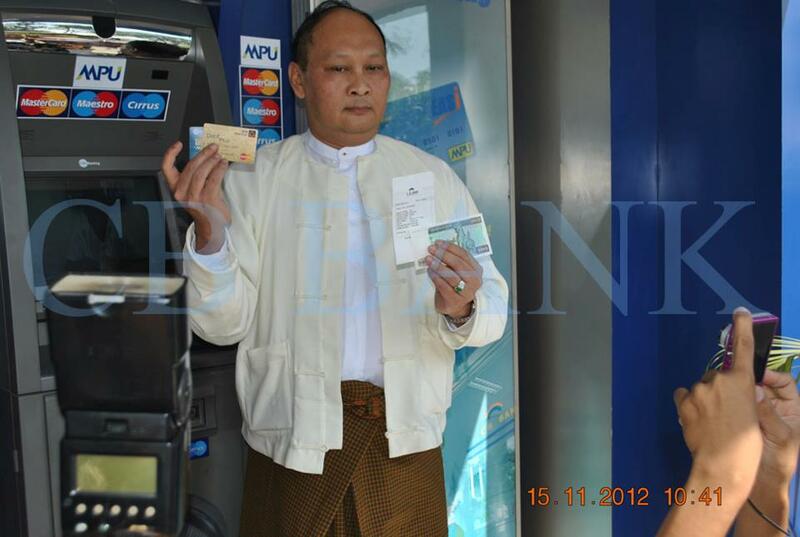 On November 15th, 2012, a few days before Barack Obama’s historical visit in Myanmar, bank card withdrawals became possible in Myanmar. In a country where every transaction have always been done with cash (except a few checks for the wealthy), where banker is a physical job (imagine 50kg rice bags full of banknotes), where ATMs only appeared last year, where most businesses cook their books and under declare their revenue, this is news. However, regardless of how convenient plastic is, Myanmar people should be cautious before selling their souls to banks. In France, my country, the State made bank accounts mandatory for paying salaries and forbade all cash transactions above 4,000 euros; after more than 40 years of that regime, normal citizens should not expect any privacy with their money, but corruption still exists at the top. Can Myanmar banks and State, regardless their eagerness to reform themselves, be trusted yet with all that information, even on the name of fighting corruption? Myanmar people can also be easily tempted by the sirens of easy money and be in trouble to pay their debts back. There is also a risk of local economy being flooded with foreign currency, a problem that is not new: since Myanmar became the new Eldorado for foreign investors, prices of hotels nights and office space rental have been skyrocketing (to the point that both are now several times more expensive than in Bangkok). Normal people yet have to see their lives improve as result of that money. I am waiting to see what will happen next. Maybe in a few months I will finally be able to use local banks to transfer Myanmar money to pay for my rent. Since I arrived in Yangon 18 months ago I had no Myanmar revenue, so I relied on friends and family bringing cash each time they visit me. At least that will be an improvement. Today, I visited with my wife the Yankin Pediatric Hospital in Yangon, not far from the Inya Lake. 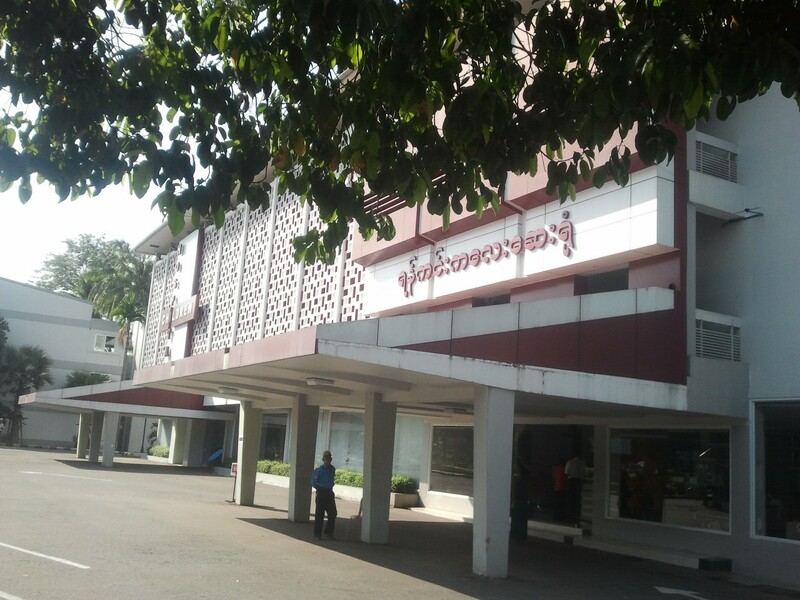 The hospital, initially a building from Ministry of Mining, has been reopened in March 2011 after undergoing extensive renovation funded by Zaw Zaw, owner of the Max Myanmar Group of Companies. We did not see many patients because the new services haven’t been advertised yet. We answered the invitation of fellow lady surgeon Dr. Win Win Kyaw, who leads the new cardiac surgery service. The new service has a dedicated ward with tens of (mostly unused) beds, a large operating room, new paint and air conditioners in every room, which is a luxury here… but no medical team to do surgery yet (this is a big problem in Myanmar). With Dr. Win Win Kyaw, a retired anesthetist and my wife there could soon be a second place to do cardiac surgery in the country (the first one being the 100-year old Yangon General Hospital, which remains mostly unchanged since its opening early 20th century)… The first children have been operated last week and seem to be doing fine. We then took the new elevator and head to the first floor to visit the Intensive Care Unit (ICU) where a few children welcomed us, looking quite happy with their toys. Winnie the Pooh, Snow White and the Seven Dwarves, Bambi were on the walls looking at us. I was pleasantly surprised after visiting the new hospital that I found much cleaner than the Yangon General Hospital. Maybe my wife will be happy here, let’s see how it turns out. In Myanmar, Thadingyut is the Festival of Light, three days to celebrate the end of the Buddhist lent. This year, Thadingyut happens between 29th and 31st October. 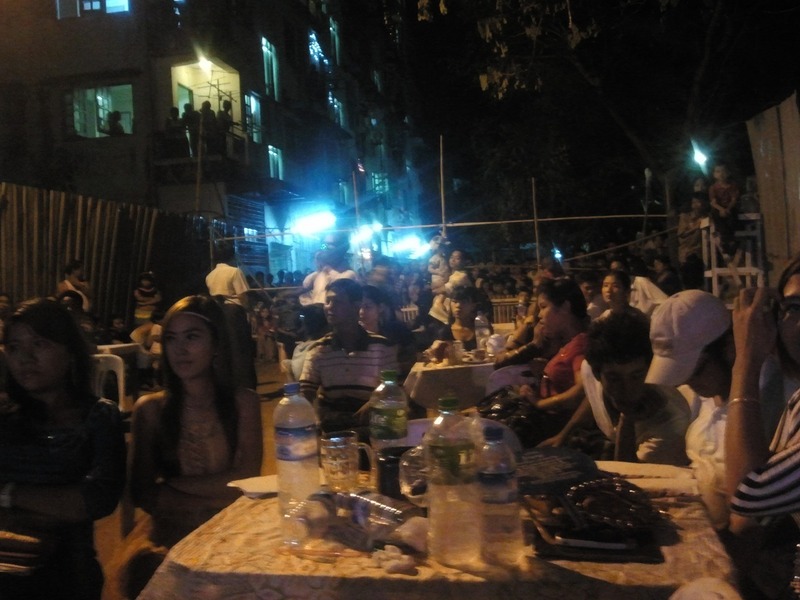 In a middle-class township of Yangon, the former capital of the country formerly known as Burma, an improvised concert stage has been erected between two buildings. A large but peaceful Crowd is filling the main street, the parking lot behind the buildings, and every window of each floor. The Diva is now singing and the Crowd is one with her. Parents, Children, Grand-Parents, Friends, Couples, Families, Single people… everyone is taken over by the music. Meanwhile a baby is crying because he hears the voice of his aunt in the distance and feels left alone. Once the four songs are over, all children and young adults come and ask the Diva for an autograph or a photograph with her. Then the Diva and her parents swim out from the Crowd, exhausted… Ei Bien Meh… Let’s return home, just opposite the street. The formerly crying baby is now enjoying deep sleep.